The NFL is officially back! Training camp has begun and preseason games are underway. 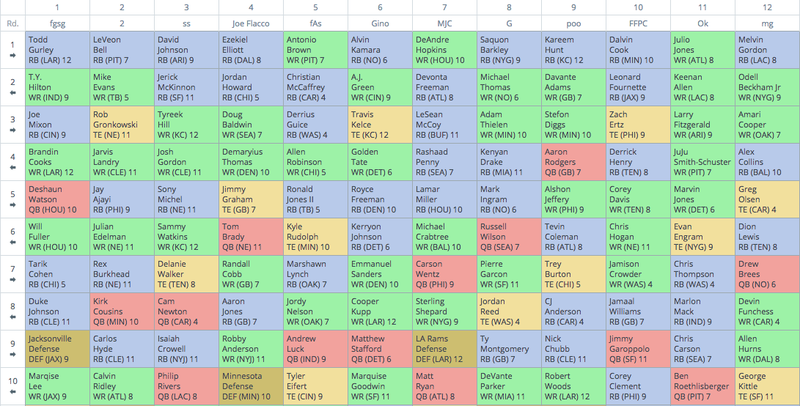 With the heart of draft season approaching, performing mock drafts is one way to gain an edge on the competition. This particular mock can be found here. Best Pick - Saquon Barkley Pick 1.08:Dropping all the way to 1.08, Saquon Barkley will likely handle the same volume as the backs drafted 1-4. 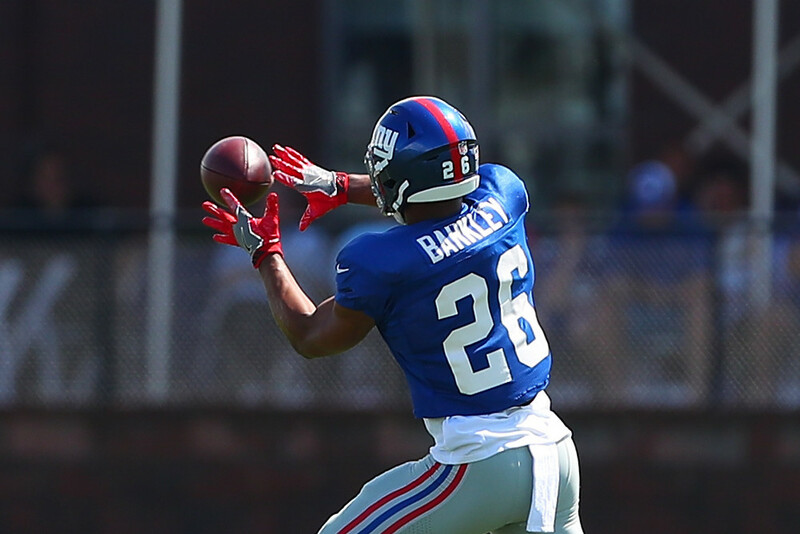 Coach Pat Shurmur noted that Barkly could touch the ball 25-27 times per game. The 2017 NCAA receiving leader for running backs, Barkely offers workhorse potential. Worst Pick - Dalvin Cook Pick 1.10:Coming off ACL surgery, Dalvin Cook may be taken along slowly in the early in the year. Cook played 65.7-percent of the Vikings snaps last season and should continue to cede work to Latavius Murray, who ranked fifth in 2017 goal-line carries. Best Pick - Leonard Fournette Pick 2.03:With an ADP of 1.11, getting Leonard Fournette at pick 2.03 presents a steal. Fournette handled 66.7-percent of the Jags' running back touches. A number that could increase, the Jags also improved their line by adding Andrew Norwell. Worst Pick - Jordan Howard Pick 2.09:Stuck in a committee with Tarik Cohen, Howard remains a stretch in the second round. Jordan Howard ranked top five in drops the past two seasons on target counts of 50 and 32. Stuck in a two down role, backs with bell-cow potential can be drafted in this range. Best Pick - Rob Gronkowski Pick 3.02:Tom Brady's preferred receiving option, Rob Gronkowski remains a value in the third round. Finishing 2017 over 1,000 for the fourth time in his career, Gronk's role should grow in 2018, without Julian Edelman for the first four games. Worst Pick - Derrick Henry Pick 4.03: Stuck in a committee, the Titans paid Dion Lewis $19.8 million for four years. A number that suggests Lewis will be involved. Derrick Henry could be relegated to an early down role, limiting his upside. Best Pick - Sammy Watkins Pick 6.10: The Chiefs signed Sammy Watkins as the fourth highest paid receiver in the league and have reportedly used him all over he field. Tyreek Hill is due for regression after his last 13 touchdowns came beyond 30-yards. Worst Pick - Jimmy Graham Pick 5.04: Boosted by his league leading 26 red zone targets, Jimmy Graham regressed as a player dropping from 1.91 yards per route run in 2016 to 1.12 in 2017. Aaron Rodgers notoriously spreads the ball around, limiting his upside. Best Pick - Rex Burkhead Pick 7.02: Despite drafting Sony Michel in the first round, Rex Burkhead should be targeted in the seventh round. Burkhead ran a route on 52-percent of his snaps and scored eight touchdowns in ten games. Burkhead should be featured around the goal line again this year. Worst Pick - Chris Thompson Pick 7.11: Primed for regression after recording 13.1 yards per reception and scoring six touchdowns on 103 touches, Chris Thompson looks overvalued in the mid rounds of drafts. Thompson will likely cede early down work to second-round rookie Derrius Guice and play a complimentary role. Prior to 2017, Thompson had never played more that 50-percent of the Redskins' snaps. Best Pick - Robert Woods Pick 10.4: Last season Robert Woods emerged as Jared Goff's preferred receiving option, leading the Rams with a 22-percent target share. The Rams played balanced football with no receiver over 94 targets in 2017. However, Wood's recorded a career high 65.1 yards per game and an ADOT of 10.8, which gels with Goff's 21st ranked Average Intended Air Yards. Worst Pick - Calvin Ridley Pick 10.11 Despite his first round pedigree, Calvin Ridley projects to play a complimentary role in an offense containing Julio Jones, Mohamed Sanu, Austin Hooper, Devonta Freeman, and Tevin Coleman. In this type of role he simply won't see enough target to pay off his cost without an injury.